Home / slider1 / REAL RESULTS In person or online, get the one-on-one help you need to reach your goals. In person or online, get the one-on-one help you need to reach your goals. Many customars take advantage of our discounted packages, while others choose to use us “by the hour”. The frequency and length of sessions are flexible, though most students find one or two 90 minute sessions per week to be ideal. 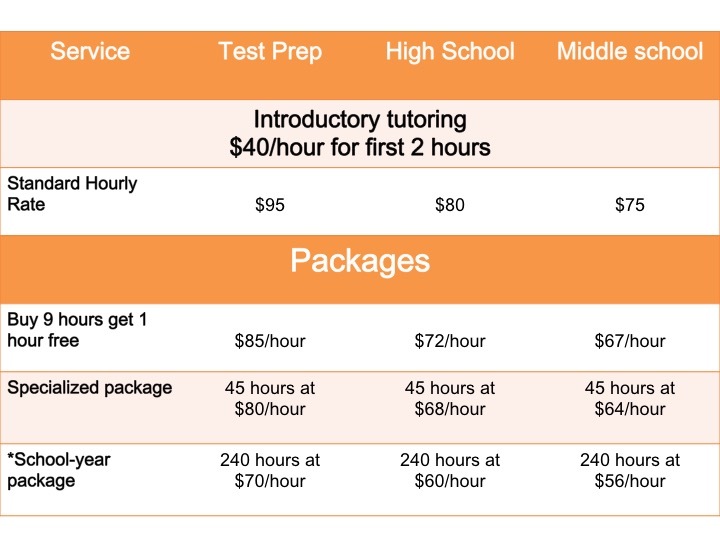 We highly recommend to purchase of 90 minute sessions due to the significant amount of preparation that tutors do in advance of a session, the effectiveness of tutoring and the best result for a student. Practice exam questions and exam technique. Each tutor has their own personal preference, but my goldilocks length is 90-minute tutoring sessions. Longer than 90-minutes and you start to worry about boredom or tiredness. Less than 90 minutes is too short for a quality session. Although we have found the options listed below to be well aligned with our students’ needs, we are happy to develop customized packages. *school-year package allows for 4 x 1.5 hour sessions per week for the entire year, covering all classes and standardized tests. Contact us for a free student assessment and tutoring consultation. What classes do you need tutoring in? Which days are you available for tutoring?